Dataguise helps MapR users safely unlock the benefits of big data with the most precise security solution that detects, audits, protects, and monitors sensitive data assets in real time wherever they live and whenever they move across repositories. Dataguise’ DgSecure makes data security painless, delivering the only one-stop, out-of-the-box solution that provides the highest level of protection – no customer programming required. With some of the world’s leading Hadoop experts on our team, we’re intensely focused on the future of big data so we can be the first to respond to emerging technologies. We’re proud to secure the data of some of the largest, industry leading companies that are committed to being responsible data stewards with MapR Technologies. Experience how precisely Dataguise detects and protects sensitive information in real time wherever it lives and moves across your enterprise and the cloud. DgSecure will secure your business with a quick-and-easy evaluation environment. Detection and management where customers pinpoint sensitive data in hard-to-profile semi structured or unstructured data sets. Dataguise fits closely inside MapR Distribution where the detection tool can lead data governance. DgSecure takes full advantage of the parallelism offered by MapR, to perform its operations. DgSecure can work on data at rest in MapR, and also with data being ingested into MapR. DgSecure can apply comprehensive protection on sensitive data fields and files within HDFS. Protect data for authorized access in HIVE, Revolution, Tableau, Platfora and throughout the Hadoop ecosystem. Utilize item-level encryption, and masking for fine-grained data security. Faster to deliver new features, more Hadoop focus. Audit and Monitor all sensitive data activity throughout MapR. Dataguise also empowers complete data visibility, Hadoop data consolidation and breach risk management by protecting sensitive data at ingest or at rest. We can provide authorized access to sensitive data in HIVE, SAS, and other analytic frameworks. Using Dataguise’s DGSecure combined with MapR enables enterprises to securely unlock opportunities for using previously sensitive data in a variety of tasks. 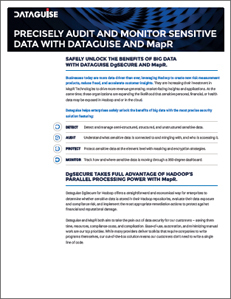 For more information, contact Dataguise at [email protected] or visit https://www.mapr.com.